Kenai riverfront cabins with majestic views. 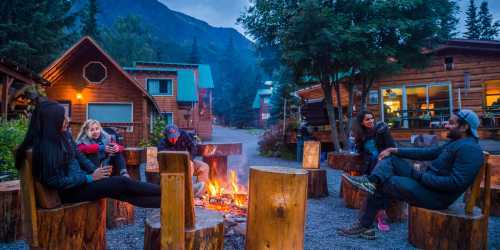 Enjoy breakfast, riverfront nightly campfire, sauna, professionally guided full or 1/2 day fishing and scenic rafting for all ages. Call for specials. This is the Alaskan Dream. When life offers you the best...Take it. Choose "Drifters" Lodge, with its' 1st Class Chalets, Super Fishing Guides and Personalized Service. We are located on the bank of the Kenai River, a picture-book 99 mi. drive south of Anchorage. Make "Drifters" in Cooper Landing your home for exploring the Kenai. Chalets & rooms have awesome river and mountain views. Enjoy comfortable, clean, fully furnished, new chalets with private baths, fridge, stove and microwave. Chalets sleep 5-7, rooms 3-4. Ease into the day with the complimentary Alaskan continental breakfast overlooking the river. In the evening relax around the nightly campfire at river's edge. The new Swedish sauna with its big picture window will ease away the days adventures.